With such a rich mix of cultures and influences, it’s no surprise that Macau is also something of a food tourism haven. The city has plenty of five-star dining options but local food is cheap and widely available. Certainly, no one should miss the chance to try out home-style dishes unique to Macau like Macanese “minchi” or the pork chop bun. Macau is truly is a 24-hour town when it comes to eating and there’s always somewhere open for food and drinks. Authentic Dim Sum: The Lung Wah Tea House next to the Red Market is one of the last remaining Cantonese style teahouses in Macau. The owner still uses an abacus to add up your bill and you still have to refill your own pot of tea at the boiler. A focal point for locals who meet here at weekends for family gatherings, this long-established tea house has been going more than 50 years and serves a wide range of traditional and freshly-prepared Cantonese dim sum such as shrimp dumplings, chicken feet, steamed pork ribs, steamed barbecued pork buns and shaomai. Open daily from 7am until 2pm. 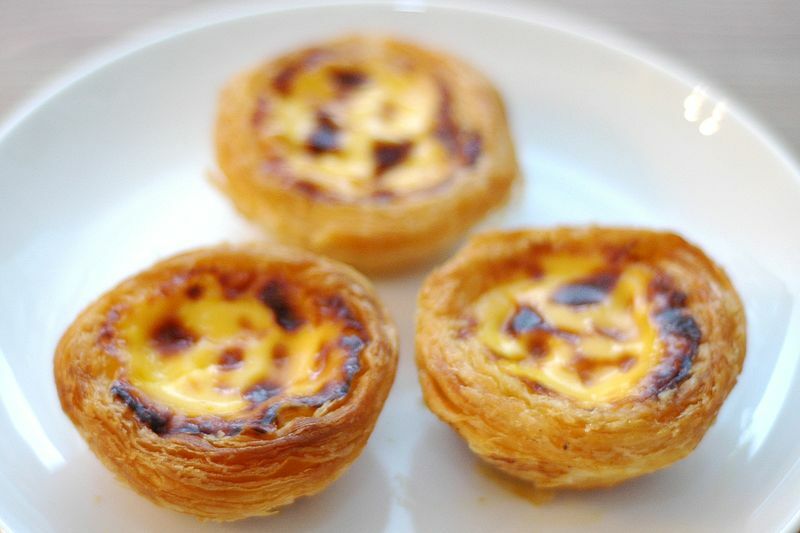 Traditional Portuguese egg tarts: Although initially a Portuguese import, Macau’s egg tarts have a surprisingly English twist thanks to and have transformed Coloane into a sort of pilgrimage for pastry-loving travellers. Englishman Andrew Stow opened the first Lord Stow's Bakery in Rua do Tassara, Coloane Town Square in 1989, creating his own recipe for the Portuguese speciality. It’s now became an edible icon for Macau and famous throughout the world. There are now several Lord Stow outlets around Macau including two at the Venetian and a branch in Rua do Cunha on Taipa island. Opening hours vary. Sunday Roasts: The Old Taipa Tavern is pretty much the closest you’ll get to a traditional pub in Macau. It's right in the middle of Old Taipa Village, on the corner of a Portuguese-style square and right next door to a Buddhist temple. There’s a good mix of Western and Asian cuisine on offer including an awesome Sunday roast. The Tavern also has a great selection of craft beers and is one of the best places to watch live sport. Opening hours are 12pm-2am. Authentic Portuguese-style cuisine: Fernando’s Restaurant, located on the south side of Coloane Island at Hac Sa Beach, is open daily from noon to 9.30pm and has been serving up delicious Portuguese cuisine for more than 30 years. You might have to wait for a table but the outdoor bar and beachside location means it’s totally worth it. Many consider Fernando’s one of the best restaurants in South East Asia, let alone Macau. Don’t miss the home made bread, the “sensational” prawns in clam sauce, sumptuous sardines and roast suckling pig, all washed down with pitchers of house sangria. Top tip: they don’t take credit cards, so bring cash.